Bitterman’s play is suitably set deep in the woods, in a cabin that is the home and studio of Simon Grindberg (played with aplomb by Dan Lauria), the world’s most illustrious children’s book writer and illustrator and a veritable recluse. Grindberg’s next book is a decade overdue, but he has shut himself away, shunning contact with the outside world. His publisher, Clair Forloni (Carolyn McCormick) is trying to reinvigorate his career, not just for his sake, but for the sake of her own lifestyle. However, Grindberg wrestles with his demons alone. 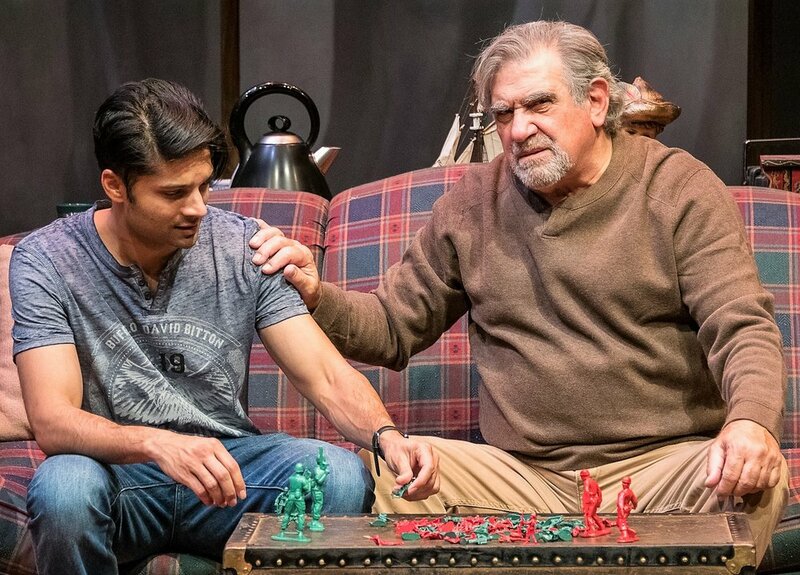 Rupak Ginn (left) plays Peter Chandler, a young artist in a battle of wits with artist Simon Grindberg (Dan Lauria) in Shem Bitterman’s The Stone Witch. Top: Lauria with Carolyn McCormick as Clair Forloni, his agent. Photographs by Russ Rowland. In her New York office, Forlani is interviewing a promising yet struggling young artist, Peter Chandler (Rupak Ginn), in her search for a suitable candidate to send up to Grindberg’s cabin as an assistant, in order to relight the artist’s fire and rouse him back into work mode. Although many have previously failed at the task, Chandler proves himself a worthy candidate, and he accepts the challenge. Though he cannot believe his luck—the chance to meet his idol, the hopes of gaining a masterly mentor, and the possibility of progressing his own work—he also does not fully comprehend what he is getting himself into. And though the story’s set-up is alive with potential, Ginn’s self-conscious portrayal of a starving artist is not entirely credible, which hinders one’s ability to embrace him fully. What follows is Chandler’s attempts to get Grindberg back on track, and Grindberg’s refusal to cooperate, with his consistent actions to thwart them. They include frightening the young artist with his fierce growls and putting him on the back foot with his grizzly attitude; using various diversionary tactics from a simple a cup of tea or dash of “medicine”; a romp in the woods and down to the lake for skinny-dipping; and a metaphorically complex game of war with green and red plastic-toy armies. Only when Grindberg’s demons appear, and he goes off on an emotional rampage, does Chandler realize he’s way out of his depth. There are probably too many irons in the tactical fire—many of which spark, then fizzle out, and none of which gets hot enough for the story to really blaze. While Grindberg and Chandler’s relationship is purposely erratic and uncertain, the depth of their rapport never quite develops the way the script would have us believe it does, and it only manages to get beyond superficial in places. And because the action jumps rapidly from one time period ahead to another without certainty as to just how far forward we’ve gone, or how the relationship has developed, the audience is left confused. 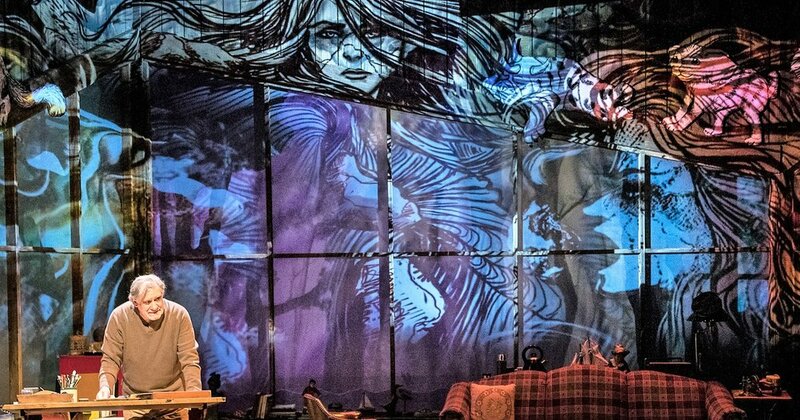 Grindberg’s imagination summons projections by Brad Peterson of the stone witch. What does work are the set and score—they are the production’s best assets. Set designer Yael Pardiss has provided a large, open-plan living room/studio with an artist’s drawing board, wall-to-wall bookshelves and lived-in furniture. Floor-to-ceiling windows provide visual access to the woods outside the cabin; and larger-than-life illustrated animal cutouts resembling the work of Maurice Sendak loom like gargoyles on the cabin’s higher beams and railings. Together they elevate the mood and deliver a feeling of wonder the essence of what the best children’s literature achieves and offers its readers. An enchanting score by Roger Bellon, in conjunction with inspired, heightened naturalistic visual effects by Brad Peterson outside the cabin’s enormous picture windows—the wind creating movement and sunlight throwing shadows of the shapes of the trees—give some lift-off to the production. The Stone Witch plays an open run at the Westside Theatre Upstairs (407 West 43rd St. between Ninth and Tenth avenues). Evening performances are generally at 7 p.m. Monday and Tuesday and at 8 p.m. Wednesday through Saturday; matinees are at 2 p.m. Wednesday and Saturday and at 3 p.m. Sunday. Tickets and information are available by calling Telecharge at (212) 239-6200 or visiting telecharge.com.